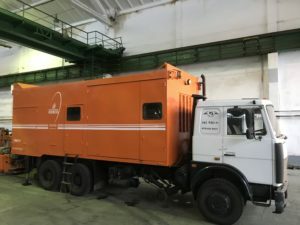 By request of the Southern Railways, KZESO Company carried out post-warranty repair of the hybrid road-rail track mobile complex KCM055 on the base of MAZ truck with the suspended rail-welding machine K922-1. KCM005 on MAZ chassis is the first generation of mobile complexes by KZESO. To date, KCM005 is manufactured on a modern VOLVO four-axle chassis, and the second generation of mobile complexes KCM007 – on a DAF 4×2 chassis with hydrostatic travel and a new technological crane-manipulator. 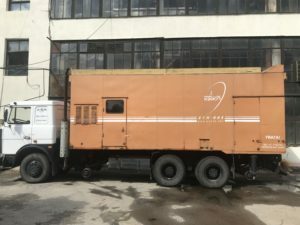 After the overhaul of K922-1 machine and the lifting mechanism, the railway workers received a bonus in the form of painting the complex body, which was not stipulated in the contract.